Whether I’m at home or at uni, a lot of the time, I’m at my desk. I have endless essays to write (and an actual dissertation right now, help), as well as writing new blog posts every week. My desk is very important to me. It’s my space of work, a clear mind and where all the positive and creative juices flow. 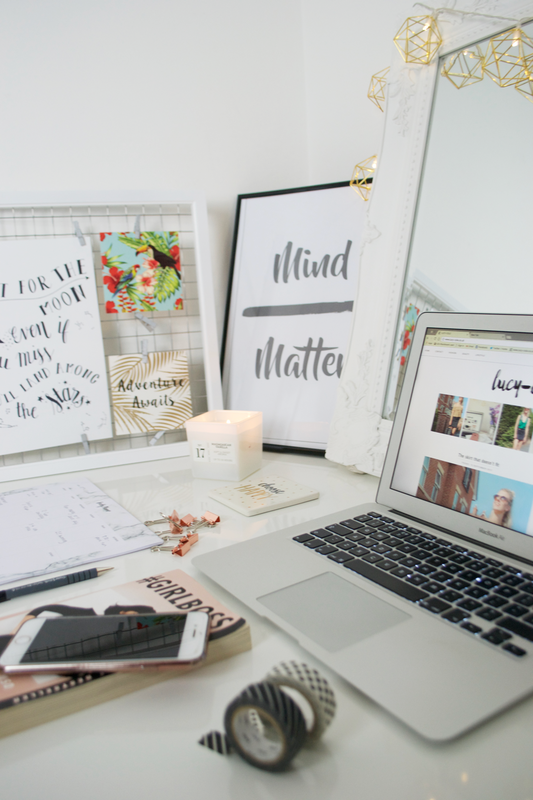 A lot of people need to work somewhere other than their bedroom to be productive – to an office, a coffee shop or a library for example, but if my desk is decked out in all the right bits and pieces, I’m perfectly fine just there. Today I thought I’d share with you just exactly what I need on my desk to make it work for me. A motivational quote. Everyone know’s know I’m a sucker for prints and quotes. For years now I’ve been sticking wise words up around my workspace. Sometimes I can get in a bit of a rut and those words are just what I need to give me a kick up the bum and to keep going. My planner. This is my holy grail. I would honestly be lost without my trusty desk planner. Every week I write down everything – what lectures I have, what blog posts I have going up, what netball training or socials I have, what I need to do that week, my weekly goals – you name it, it’s on there. Having this on my desk to look at helps clear my mind and organise my week so much better. Some people work by having all this inside their head but I really love to write it down as a visual aid to help me through the week. Books, stationary, post-its. There are always books on my desk, whether they’re for uni or for my own fictional enjoyment! Of course stationary is a no-brainer, although I do a significant amount of work on my laptop, some tasks are done much better with a pen and paper. Recently I’ve made sure I have a chunk of post-it’s handy to help with different things pottering about in my brain. I’ve used them a lot for sorting out my dissertation structure, but also for blog post ideas or anything else that pops into my brain that I’m sure to forget about. Of course, they’re the main bits and pieces, but there are plenty of other things that help me get by at my desk. Some snacks, while I work, are always well appreciated, and a cup of tea is nearly always sat next to me. The writing juices always flow better when I’m well fuelled!